American Airlines realizes that more suitcases coming onboard planes means more time it takes to get people boarded. Therefore, the airline is allowing folks who have small carry-on items to board before those folks with larger suitcases, in an effort to decrease the number of roller bags on planes. This decision should help get the airline jets moving quicker as well, boosting its on-time arrival rate. The change enables travelers to bring on one bag for free, circumventing the $25 fee many airlines had put into place. According to American’s Supervisor for Continued Improvement Daniel Bellavigna, the four-week test showed a two-minute improvement in boarding, which can add up significantly. March data showed that 20 percent of the airlines were delayed, with seven percent of them being late because of late-arriving aircraft. American Airlines had the worst on-time record. American had a terrible 2012 with on-time performance due to angry employees and bankruptcy court restructuring. At the end of March 2013, American had a ranking of next to last, coming in ahead of regional airline ExpressJet. Hudson Crossing’s travel industry analyst Henry Harteveldt said American managers got a glimpse that some of their delays were due to some passengers being unable to find room for the carry-on bags. Another bag issue American is facing is some of the older MD-80 jets are not equipped to handle roller bags, which reduces how many bags the airline can accommodate. 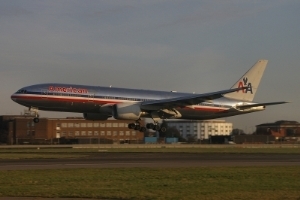 However, American Airlines is in the process of upgrading those 1980s jets to the Boeing 737s. At this time, the airline has approximately 200 MD-80s still in flight. These jets require roller bags to fit in sideways. In June 2008, American caught people by surprise when the airline introduced a $15 fee to check in one bags – a move that the majority of airlines jumped on board with and at a time that record-high oil prices were cutting into their finances. Since that time, more than $6 billion has been generated for the airline industry. Posted by News on May 18 2013. Filed under Business, Featured, New, Travel. You can follow any responses to this entry through the RSS 2.0. Both comments and pings are currently closed.